Not to be confused with Elliptic coordinate system. Earth-centered ecliptic coordinates as seen from outside the celestial sphere. Ecliptic longitude (red) is measured along the ecliptic from the vernal equinox. Ecliptic latitude (yellow) is measured perpendicular to the ecliptic. A full globe is shown here, although high-latitude coordinates are seldom seen except for certain comets and asteroids. The celestial equator and the ecliptic are slowly moving due to perturbing forces on the Earth, therefore the orientation of the primary direction, their intersection at the Northern Hemisphere vernal equinox, is not quite fixed. 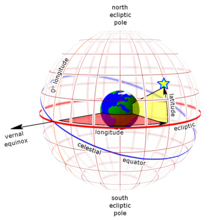 A slow motion of Earth's axis, precession, causes a slow, continuous turning of the coordinate system westward about the poles of the ecliptic, completing one circuit in about 26,000 years. Superimposed on this is a smaller motion of the ecliptic, and a small oscillation of the Earth's axis, nutation. (usually the J2000.0 epoch, but may include B1950.0, B1900.0, etc.) is a fixed standard direction, allowing positions established at various dates to be compared directly. A position in the ecliptic coordinate system is thus typically specified true equinox and ecliptic of date, mean equinox and ecliptic of J2000.0, or similar. Note that there is no "mean ecliptic", as the ecliptic is not subject to small periodic oscillations. Ecliptic longitude or celestial longitude (symbols: heliocentric l, geocentric λ) measures the angular distance of an object along the ecliptic from the primary direction. Like right ascension in the equatorial coordinate system, the primary direction (0° ecliptic longitude) points from the Earth towards the Sun at the vernal equinox of the Northern Hemisphere. Because it is a right-handed system, ecliptic longitude is measured positive eastwards in the fundamental plane (the ecliptic) from 0° to 360°. Because of axial precession, the ecliptic longitude of most "fixed stars" (referred to the equinox of date) increases by about 50.3 arcseconds per year, or 83.8 arcminutes per century, the speed of general precession. However, for stars near the ecliptic poles, the rate of change of ecliptic longitude is dominated by the slight movement of the ecliptic (that is, of the plane of the earth's orbit), so the rate of change may be anything from minus infinity to plus infinity depending on the exact position of the star. Ecliptic latitude or celestial latitude (symbols: heliocentric b, geocentric β), measures the angular distance of an object from the ecliptic towards the north (positive) or south (negative) ecliptic pole. For example, the north ecliptic pole has a celestial latitude of +90°. Ecliptic latitude for "fixed stars" is not affected by precession. Distance is also necessary for a complete spherical position (symbols: heliocentric r, geocentric Δ). Different distance units are used for different objects. Within the Solar System, astronomical units are used, and for objects near the Earth, Earth radii or kilometers are used. From antiquity through the 18th century, ecliptic longitude was commonly measured using twelve zodiacal signs, each of 30° longitude, a practice that continues in modern astrology. The signs approximately corresponded to the constellations crossed by the ecliptic. Longitudes were specified in signs, degrees, minutes, and seconds. For example, a longitude of ♌ 19° 55′ 58″ is 19.933° east of the start of the sign Leo. Since Leo begins 120° from the vernal equinox, the longitude in modern form is 139° 55′ 58″. In China, ecliptic longitude is measured using 24 Solar terms, each of 15° longitude, and are used by Chinese lunisolar calendars to stay synchronized with the seasons, which is crucial for agrarian societies. Heliocentric ecliptic coordinates. The origin is the Sun's center, the plane of reference is the ecliptic plane, and the primary direction (the x-axis) is the vernal equinox. A right-handed rule specifies a y-axis 90° to the east on the fundamental plane. The z-axis points toward the north ecliptic pole. The reference frame is relatively stationary, aligned with the vernal equinox. A rectangular variant of ecliptic coordinates is often used in orbital calculations and simulations. It has its origin at the center of the Sun (or at the barycenter of the Solar System), its fundamental plane on the ecliptic plane, and the x-axis toward the vernal equinox. The coordinates have a right-handed convention, that is, if one extends their right thumb upward, it simulates the z-axis, their extended index finger the x-axis, and the curl of the other fingers points generally in the direction of the y-axis. where ε is the obliquity of the ecliptic. ^ Nautical Almanac Office, U.S. Naval Observatory; H.M. Nautical Almanac Office, Royal Greenwich Observatory (1961). Explanatory Supplement to the Astronomical Ephemeris and the American Ephemeris and Nautical Almanac. H.M. Stationery Office, London (reprint 1974). pp. 24–27. ^ U.S. Naval Observatory, Nautical Almanac Office (1992). P. Kenneth Seidelmann (ed.). Explanatory Supplement to the Astronomical Almanac. University Science Books, Mill Valley, CA (reprint 2005). pp. 11–13. ISBN 1-891389-45-9. ^ N. Capitaine; P.T. Wallace; J. Chapront (2003). "Expressions for IAU 2000 precession quantities" (PDF). Astronomy & Astrophysics: 581. Bibcode:2003A&A...412..567C. doi:10.1051/0004-6361:20031539. ^ Leadbetter, Charles (1742). A Compleat System of Astronomy. J. Wilcox, London. p. 94. ; numerous examples of this notation appear throughout the book.